One of our all-time favorite ingredients, it's hard not to fall in love with the warm, almost spicy qualities of ginger. With a wide variety of uses and potential health benefits, ginger is a perfect focus for the cold, long nights. Here's the thing: ginger, it's not a root. We know, we know, it's hard to believe. But ginger is actually a rhizome, which is basically the underground stalk of certain types of plants. With origins in Southeast Asia, ginger has played an important role culinarily and medicinally for thousands of years. In this time period, over 1,300 different varieties of ginger have been discovered. In medicine, ginger has been used for over 4,000 years to treat a host of ailments, ranging from nausea and gastrointestinal discomfort to helping ease cold and flu symptoms. While it's hard to claim that ginger is a magical cure-all, more and more studies are being conducted that show the promising powers of ginger. While it shouldn't be the only thing in your homeopathic first-aid kit, it would be silly to leave it out! In the kitchen, ginger has a wide variety of uses from sweet to savory. In China, for example, ginger is often paired with meat, while in Japan, pickled ginger is commonplace at sushi restaurants, often used to "cleanse the palate." While many uses of ginger revolve around the "root," in Vietnam, the leaves of the Ginger plant are sometimes used with a variety of other herbs to garnish soups. This is an interesting way of incorporating ginger, as it is often much mild than other parts of the plant. Unfortunately, ginger leaves are difficult to find in the United States as there is little demand. Beyond Asian food culture, ginger has become prominent in Western cuisine as well. In fact, when ginger was initially introduced to Europe, it quickly became the second most popular spice, right after peppercorn. Today, we often see ginger incorporated into sweet treats. However, as we become more health-focused, ginger has found its home in the natural foods world, especially in juices and smoothes, with good reason. Make a simple ginger tea by steeping fresh ginger and lemon peel in hot water. Snack on candied ginger for a sweet and spicy (and less guilty) treat. Add some fresh ginger to your next beef marinade to kick up the flavor. Ground ginger has a wide variety of uses when baking, beyond gingerbread men and pumpkin pie. And, of course, you can swing by your local I Love Juice Bar for a number of Juices, Smoothies and Shots that are packed full of ginger! We have a few awesome menu items that highlight the incredible flavors and powers of ginger. Our "Ginger Greens" juice gives you a nice dose of ginger, and tastes so, so good with the apple, kale, spinach, cucumber, parsley and lemon. Ginger is also added to all of our "root" juices. It's amazing how well ginger pairs with the flavors of root vegetables like carrots and beets. In our smoothies, you can find ginger in "The Doc" and "Orange You Smooth." Both of these smoothies have mint and frankly, this flavor combination is out of this world. Ginger can also be found in a wide variety of our shots. Looking for a serious dose of the good stuff? This is the way to go. One of the best is the "Sniffle Stopper," which we've designed using ginger as one of the main ingredients to help your body fight that nasty cold. The "Ginger and Cayenne shot" is a sure-fire way to warm you up and get a serious dose of ginger! And don't forget. You can always add any of our shots to your smoothie or juice. That means you can make sure that all of your favorites have a little kick of ginger! 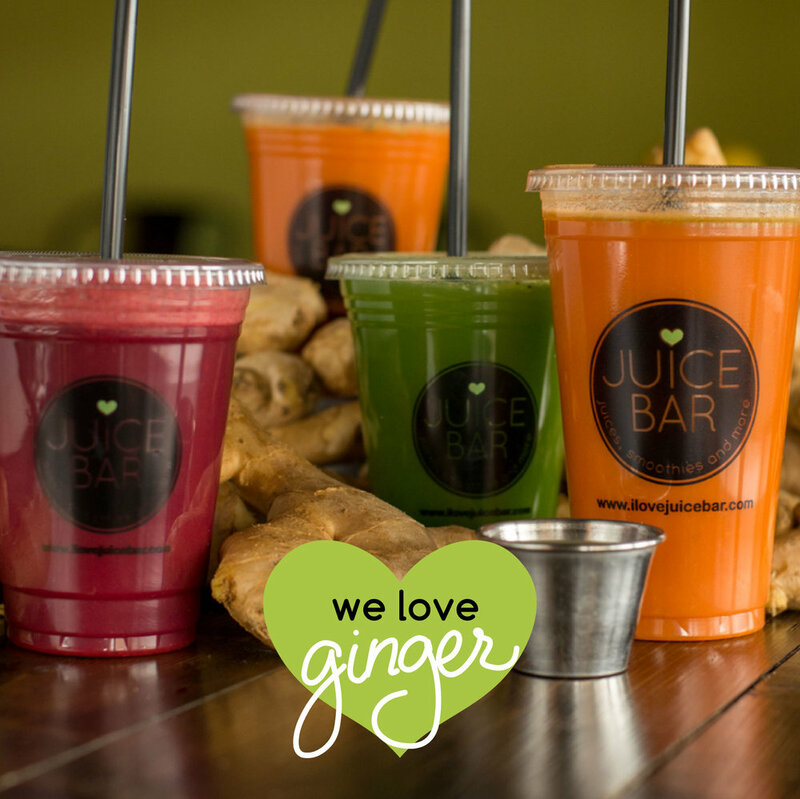 Check out all things "ginger" from Juice Bar!